Solder without draining the entire system! Change out a valve, solder or glue on fittings, make line repairs and test lines while under pressure with the Water-Gate. There’s no need to shut off water to the rest of the building, drain lines, use bread clogs or freeze lines. Ideal for refrigeration and boiler applications, the Water-Gate’s seals withstand temperatures from -20°F to 225°F. The Water-Gate water shut-off tool works on copper, steel or PVC lines and is pressure rated to 65 psi. 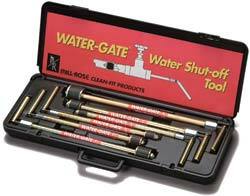 77070 1/2"-1" Water-Gate Kit 1 3.8 lbs. 77080 1/2"-2" Water-Gate Kit 1 7.9 lbs. Works with full port ball & gate valves to seal off water.